In 1931, a photographer captured this view of one of the railcars of the L & N Pan-American teetering over the Mobile River. A heart attack was blamed for the disaster. Photo courtesy of the Erik Overbey Collection, The Doy Leale McCall Rare Book and Manuscript Library, University of South Alabama. Q: Was there another train wreck similar to the Sunset Limited disaster? 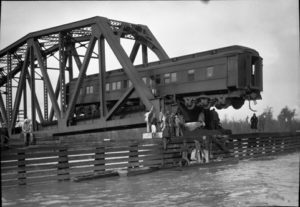 In February of 1931, a northern-bound train plunged into the Mobile River. In both cases, a tugboat and barge had roles to play. In 1993, the Sunset Limited was bound for Miami, and its engineer was trying to make up for lost time by traveling an estimated 70 mph on a very foggy night. The heavy fog had earlier disoriented a tugboat operator, sending his craft off course and bumping the supports beneath a railroad bridge. That impact shifted the rails enough to send the speeding train careening into a muddy bayou, killing 47 people. On Feb. 25, 1931, the Louisville and Nashville Pan-American made a scheduled stop at its station at the foot of Mobile’s Government Street. It had left on time at 12:17 a.m. with a planned stop in Birmingham. The train plied a route between New Orleans and Cincinnati for nearly 50 years and included Pullman sleepers and a popular dining car. In just half an hour the train was approaching a drawbridge over the Mobile River, which stood open to allow the tugboat “Bearcat” to pass with its barges. The vessel traveled on as the bridge tender watched. To his horror he heard a train approaching, despite a red light warning nearly a mile to the south. The locomotive and the combination baggage and dining cars plunged into the river. Miraculously, a braking system detached the cars beyond, and there were no injuries among the sleepy passengers. The estimated speed of 20 mph was a factor in the relatively few deaths that night. Passengers recalled feeling the train coming to a sudden halt, which awakened many of them. A Birmingham man walked to the door of the dining car and found nothing but water in the darkness below. He would later discover that a full third of that railcar was hanging off the open bridge. Unlike the 1993 disaster, there were no injuries among the passengers. The crowd quietly filed out of the back of the train using matches to light their way. Divers would recover the body of the 59-year-old engineer who had earlier in the day complained of feeling ill. Investigators surmised that he had a heart attack, and before his ill-fated assistant realized the problem, it was too late. A porter in the dining room and the baggage master also perished. Experts agreed that had the train been traveling at a higher speed, the death toll would certainly have been far greater. According to the Mobile Register, divers had to bring up one more body, this one already in his casket. Birmingham native Harry Strickland was bound for burial in his hometown. He had moved to Tucson, Arizona, hoping the dry heat would help his tuberculosis. It didn’t, and he died at the age of 27. A day after the disaster, the Rotary Club of Mobile had their weekly meeting at the Battle House. Club president Gordon Smith offered a special prayer for the three Mobile Rotarians on that train: insurance executive, Russell Ladd Sr., and Alabama Power Company executives, Theodore K. Jackson and Arthur D. Quackenbush. Like their fellow survivors, all had left the disaster unscathed.